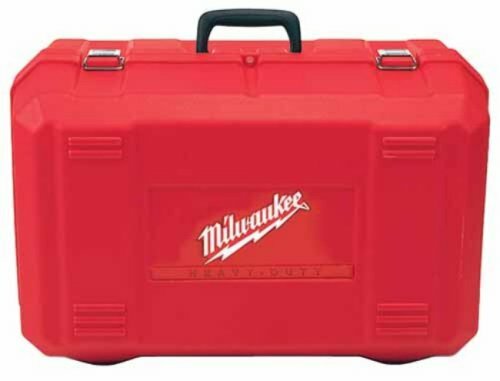 The Milwaukee Carrying Case for cordless circular saws provides a convenient and safe place to store cordless circular saws. Ideal for storing both the tool and its related accessories, this well-built case allows you to keep everything in one spot for the job at hand. Designed to perfectly fit Milwaukee cordless 6-1/2-inch circular saws, including models 0730, 6310, and 6320, the case features custom molded, lightweight, rust-proof, and impact resistant plastic. The quality is fine, but I give it 1 Star because I should not have had to buy this case at all. I just could not stand to store $700.00 worth of the new V 28 tools in a flimsy nylon bag, so I had to buy this case. I also purchased the hammer drill case & recip saw case as well. Shame on Milwaukee for not providing a blow molded case to store these tools when purchased as a kit. The 36 Volt DeWalt system comes in a nice fitted case that stores all four tools, batteries & a charger with no problem. Great design on the case. Holds my 18V cordless saw, 2 batteries, and a charger. Has a blade storage section in the bottom of the case below the saw. Even has a slot in the lid to store the available rip fence. It is deeper than you'd expect, as another reviewer noted. 1 star off for 2 things. First, the blade storage has a post molded into the bottom of the case - but the nut that screws the blades down was missing when I got it. A call to the Milwaukee tech line (their general support line had no indication of this part) got me 2 mailed out immediately. Second, unlike the sawzall and drill cases, there is no slot for the manual. Not a big deal since I don't even refer to the manual and could just chuck it, but I do prefer to keep them with the tools. Right now it's folded in half and shoved in the spare battery section. Definitely does it's intended job. This is another quality product from Milwaukee. Shame the review (stars) don't reflect this. The quality of this case has NOTHING to do with whether it comes in a combo pack or not. The case is sturdy and fits the saw, 1 battery and a charger. The clasps are nice and easy to open. I have a few other brands of tools with hard cases that you need the hands of a 10 year old to be able to open. Milwaukee was smart enough to design latches that someone with larger hands can open easily. If you dropped the cash on the saw, this is definitely worth it to protect your investment. This case is an excellent fit and protects the saw, battery, charger, and more. I do notice that, with the V28 at least, you need to lower the cutting height before the case will close ~ not a big deal, just something to be aware of, and something that reveals the close fit needed to keep the saw from bouncing around too much on the back of a truck. This case for Milwaukee's cordless circular saws is almost perfect; deeper than you think by the picture (approx 11") molded very well to the V18 battery, the charger, and the saw. It has a blade nut to keep extra blades in the case under the saw. I had to deduct 1 star because Milwaukee changed the handle design from a 1-1/4 diameter 4-pinion contact (4 contact points to the case) to a 2-pinion 3/4" diameter handle. Physics tells us that a 4-pinion handle design will take more stess on the handle than the 2-pinion design given the same pinion diameter which is the case. Why did milwaukee change the design? Don't know--but the Chineese designer probably thought it was a good idea. NOT. I bought this for my 18 Volt Circular Saw mainly for protection of the saw since the saw doesn't have one included as part of the purchase. The case is very durable and similar in design to Milwaukee's corded Circular Saw Case. It has a place under the saw for extra blades and other snap in spots for accessories. Its was worth the money to keep the saw from getting banged around in the bucket of the tractor. It would just be nice if these were included in purchase of the saw.